Cream of asparagus soup is a dish I recently served for a dinner party as a first course. 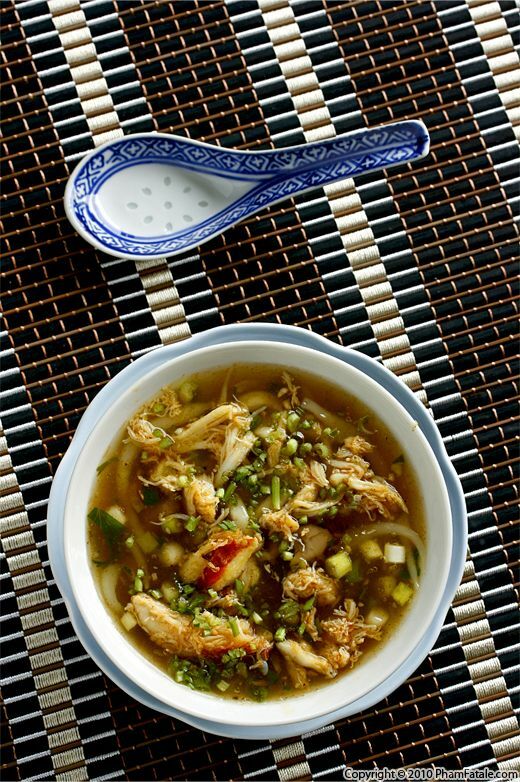 The soup is packed with asparagus flavor. This is because I made the vegetable stock with the roots from the asparagus, then I blended in the asparagus that I roasted for a few minutes. The usual roux helps thicken the soup to which I then added St Félicien cheese, -one of my husband Lulu's favorite cheeses-, for extra creaminess. This step is optional but if you want to be met with a round of "oohs" and "ahs" when the bowls of soup are brought to the dinner table, I suggest that you cover the bowl of soup with puff pastry. For decoration, top with a little saffron cream and an asparagus spear. It's a truly seductive way to start a meal. 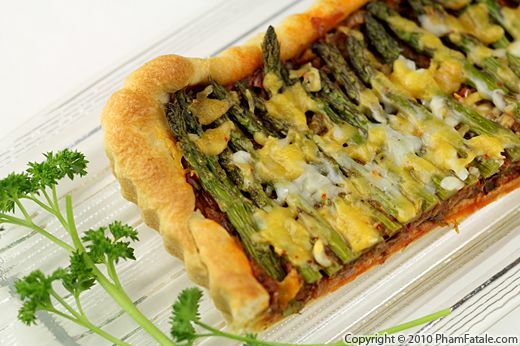 Asparagus tart is a delightful, tasty, light meal. It's perfect when you have your girlfriends coming over for lunch. I don't know why, but there is something fancy about these green, long-stemmed vegetables. It's perfect if you're serving a vegetarian meal that contains no egg. And if you're looking for a similar recipe with eggs, you could always make a quiche. To make the dish, I caramelized leeks and a fennel bulb in a pan, then added Indian-style tomato chutney. I like the kick from the Indian spices and I think they really highlight the asparagus well. This mixture forms the base of the tart. Finally, I topped the tart with roasted asparagus and gave them a light sprinkling of jalapeño cheddar cheese. I love combining Indian and French cuisine. At first blush, it may seem like these two styles of cooking would clash, but if care is taken, you can really make some special dishes. The trick is to reduce the heat from the Indian components of the dish and to pick French dishes that have bold flavors. This approach works both ways; I’ve made a mustard-based raita that is absolutely amazing with khichdi (rice cooked with coral lentils). Until I got married, I didn’t really have much exposure to Indian food. So I guess I have my husband Lulu to thank for broadening my culinary horizons! I receive many questions and recipe suggestions from readers. It might take a while for me to respond but I want you to know that I read every single one of them and they always fill me with joy. 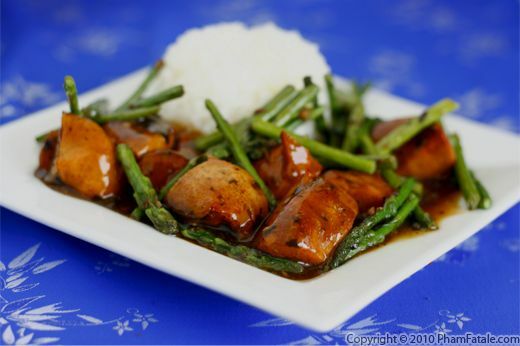 So here's Bill's (a regular reader) recipe for asparagus chicken. I didn’t make many changes; I just added a few more bold and spicy flavors to counteract the blandness of chicken. Specifically, I used black bean garlic sauce and red chiles, in keeping with the Asian theme of the dish. The key to making sure this dish turns out well is not to overcook the asparagus. I chose to use baby asparagus in this dish but regardless, it should be bright green and still have some crunch . The texture, if cooked properly, is wonderful, and baby asparagus is visually appealing to boot. "I got this recipe a very long time ago while taking a cooking class at “Isle of Skye Kitchen” in Saratoga [California], a combo antique store and vendor of exotic spices ... long gone. It has been a family favorite for years. Here it is with some personal experience updates." 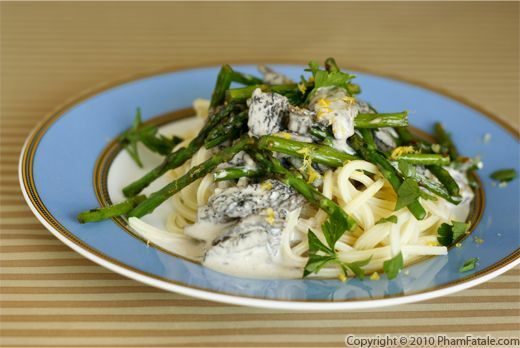 Roasted asparagus pasta with fresh morels (pâtes aux morilles fraîches et asperges vertes) is a creamy, rich pasta dish. How could it not be delicious? First, I sautéed the morels in butter, added a white sauce (béchamel) mixed with crème fraîche, then tossed spaghetti rigati in the sauce. The final touch was roasted baby asparagus for contrast of color and some crunch, and lemon to cut the richness of the sauce. I chose baby asparagus because it most closely matches the thickness of the pasta and you can eat the whole stalks. It was a perfect meal for a romantic dinner with my husband. I'm trying to be better about my eating habits, so I served smaller portions with a big salad. Eating right doesn’t have to mean giving up the foods you like. In fact, I think we have a better chance of maintaining healthy eating habits if we’re enjoying our meals. So enjoy this pasta; it might even help you lose weight!